ProMax SWIM JIG offers unmatched balance and swim-ability, the ultimate swimming bait is not for the faint of heart! It can be flipped or pitched into cover with a rapid retrieve for a horizontal presentation for explosive strikes and positive hooksets. The ProMax SWIM JIG is available in 1/4 and 3/8 oz. weights in 11 different colors. The 26 degree black nickel custom forged (SuperLine) Mustad® hook keeps Bass buttoned up after the hookset, and the perfect weed guard allows the ProMax SWIM JIG to be fished out of the pack without trimming or tuning. A built in trailer keeper system holds any type of trailer in place, even after heavy use and repeated casts. J SERIES SWIM JIG features a perfectly balanced swim head and an awesome 5/0 hook for unprecedented hook sets. It is available in both 1/4 or 3/8 oz. weights and 15 different hand painted unbelievable colors for every water color and temperature condition. The DAVIS BAIT WOOD JIG is perfect for use as a Casting or Flippin’ Jig, this jig is built with an extra-strong, ultra-sharp, black nickel Gamakatsu hook. The jig comes in both 3/8 and 1/2 oz. weights, and in 11 different color / Silicone skirt combinations. The DAVIS BAIT method for painting is un-rivaled in the industry, resulting in an extremely chip resistant life like paint coating that continues to produce high demand results, cast after cast. The DAVIS BAIT WOOD JIG is one of the best you can buy. The DAVIS OLD SCHOOL LIVING RUBBER JIG is like the new kid on the block. It is made of life like Living Rubber, Premium Forged Needle Point Hook and life like chip resistant paint finish. This is a high quality jig at a discount price. 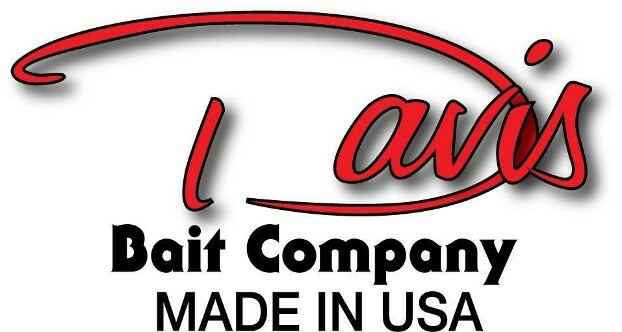 Another great in the quality line of jigs from DAVIS BAITS, The ROCK CRAWLER is the ultimate jig as far as quality workmanship and appearance, made in the USA. Choose from the 1/4, 3/8 or 1/2 oz. and a wide variety of colors.